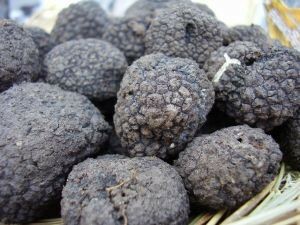 Truffle, which comes to English through French, derives initially from the Late Latin tufera, which is cognate to the Latin tuber, which was used before, as now, to refer to an edible root. Small delectable balls of chocolate became known as truffles only in the 1920s, due to their apparent resemblance to the black truffle of Southwest France, (tuber melanosporum) one of the most prized varieties. Truffles, explains the Mycological Society of San Francisco, are one of the most expensive foods in the world, selling for between $250 and $450 per pound. The real ones need to be carefully identified; they are similar in appearance to a much wider range of so-called false truffles, some of which are poisonous. Finding these treasured tubers is work beyond the abilities of humans. For the purpose of sniffing them out, female pigs are sometimes used because the smell of truffles underground resembles the smell excreted by male swine. The problem here is that after hunting down the truffles, perhaps thinking that a suitable mate is lurking in the area, pigs have a tendency to eat the truffles. For this reason, dogs — sometimes called “truffle dogs” (this sounds like an elite form of a ballpark snack) are trained for the purpose. Go to the website of NW Truffle Dogs, and you’ll learn that “dogs can be taught new tricks,” in this case tricks that might earn you $300/lb of harvested truffles if you live in the Pacific Northwest, where truffles grow naturally. After all, they remind us, “Trying to fish a truffle from the mouth of a hungry hog is a treacherous task” and dogs are far more amiable. The original chocolate truffle consisted of ganache, chocolate and cream, all rolled in chocolate powder. The Nibble, which specializes in specialty foods, writes that, according to lore, this concoction came about by accident in the kitchen of Auguste Escoffier, the French culinary great known for modernizing and systematizing the production of French fare. A confused kitchen apprentice, the story goes, combined hot cream with chocolate chunks instead of with the sugar and egg he had intended to pour it into, and out came a malleable paste that could be shaped into a ball. Inspired, he rolled the resulting mass in chocolate power, and, behold, before him was a brown lump that looked quite a lot like the celebrated black truffle. Technically speaking, The Nibble points out, all true truffles from that point forth have ganache in the middle, though the coating can vary. To the dismay of dessert purists, a new sort of false truffle leads unschooled consumers astray. Though the result are not poisonous, less scrupulous companies market all matter of filled chocolates as truffles, leading to a horrible Forrest Gumpian outcome. It’s worth a digression here to note that the word GANACHE itself, that sine qua non of the true chocolate truffle has a rather interesting history as well. Ganache means “imbecile” in French. How did this come about? Chocolate-covered lore holds that it was that same luckless apprentice whose error coined the term. After incorrectly mixing his ingredients and noting the curious appearance of the resulting creation, he was called a “ganache” by his disappointed supervisor. Only upon tasting the result did the boss deem the creation worth saving. The truffle and the ganache, it seems, were born at the same time. These stories may strain credulity, but they fit into a long tradition of stories of things created “by accident,” a list that, as one source compiles it, includes Coke, Teflon, Vulcanized rubber, the potato chip, penicillin, and the color mauve. The truffle is no trifle — it, and its history, are meant to be savored. Liora Halperin is an Assistant Professor of Near Eastern Studies and Judaic Studies at Princeton. She writes about language and history and particularly enjoys discovering interesting word origins.